Lahore (Agenzia Fides) - "Every year when I hear and think about the attack of March 15, 2015, I deeply feel the pain my people faced in Lahore, fearful memories lead me to think that we are not safe in our country": this is how Archbishop Sebastian Francis Shaw, Archbishop of Lahore, expresses himself to Fides, who celebrated Mass in the church of Saint John, offering it for the martyrs of the deadly attacks that took place in the two churches of Youhanabad, an area where there are 100,000 Christians. The Archbishop personally met the relatives of the victims and those who were injured. "The attack took place against people in prayer, this is very painful and intolerable - he underlined -. Today I am here to be with my brothers and my sisters who have lost their loved ones, we prayed together for all our martyrs and thanked God for saving the lives of more than 1,500 people present in the churches". The Archbishop expressed particular appreciation for the courage and spirit of service "of our security volunteers, present at the doors of the church, who did not allow the aggressors to enter". In fact, both bombers blew themselves up at the door of St. John's Catholic Church and Christ Church, causing 21 dead and 80 wounded (see Fides 15/03/2016). Paying tribute to the young Christians who were killed, Mgr. Shaw said: "All our martyrs are blessed, they lost their lives to defend their faith and sacrificed themselves to save their people inside the church, they remained faithful to their responsibility to protect people until their last breath. I am sure they have obtained the crown of eternal life". The Archbishop expressed gratitude for the armed forces, in particular for the Pakistani army, "always present in every part of the country for our security and protection". Mgr. Shaw called Christians in Pakistan to pray also for the victims of the brutal attacks that took place in two mosques in New Zealand: "We are saddened by the killings in mosques, especially because they were people gathered for prayer. Let us pray even for the people who mourn their loved ones, it is a great loss for them. 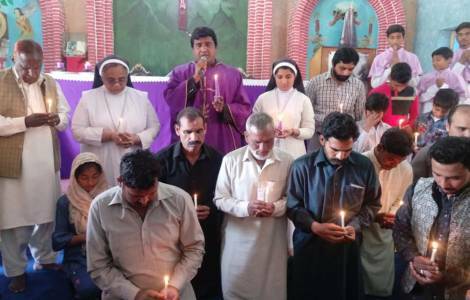 May God console them and give them the strength to endure this loss", He added: "We can understand the pain of those people, many times we Christians in Pakistan have gone through this pain and we still suffer for it".